Review: "Nick Moran Trio: No Time Like Now" - Sea of Tranquility - The Web Destination for Progressive Music! 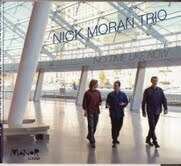 New York jazz guitarist Nick Moran has another winner here with the upcoming release No Time Like Now, featuring his trio that also includes organist Brad Whiteley and drummer Chris Benham. Paying homage to the classic organ trios of Lonnie Smith or Jimmy Smith, Moran and Co. take it one step further by incorporating a love for rock and blues into the jazz formula. All three players show that love in the opening cover of Cream's "Strange Brew", a fiery rendition with Whiteley's organ really snarling and getting gritty. Moran himself is a tasty player, and it's obvious he's studied the work of Grant Green, Wes Montgomery, and Lee Ritenour since first picking up the guitar. Check out his silky lines on "My Beautiful", the mournful blues of "Intention", or the funky licks that lock in with Whiteley's organ on "Slow Drive". All the while, Benham is there at every corner, restrained yet keeping things in check with some solid rhythms. You have to love the smoldering tension of "Wishful Thinking", which features a more rock based solo from Moran, while the melodic title track is sweet jazz at its finest. Benham locks into a funky groove over which Whiteley can solo over on "Say Hi To Paris", and closer "Renewal" is a focused number with some very tasty guitar and organ solos. If you have a soft spot for the 'organ trio', you can't go wrong with giving No Time Like Now a try. Featuring three outstanding musicians and some enjoyable songs, it's a CD well worth investigating, and I'll bet these guys are hot in a live setting as well. Brooklyn based guitarist Nick Moran is back with another album entitled No Time Like Now, the follow up to his debut The Messenger released in 2006. The rest of his trio includes Brad Whiteley (organ) and Chris Benham (drums). Whether exploring a bittersweet ballad or going for a funkier groove, No Time Like Now is worth your undivided attention. The album includes nine original compositions and one cover; the Cream classic "Strange Brew". The Trio really make this one their own with crystal clean lead guitar, delicate phrasings and percolating Hammond. With "My Beautiful" the trio has a gentler touch, opting for a more delicate approach whereas the bustling "Slow Drive" pulls out all the stops with its funky groove and exceptional pocket presence from Benham. "Wishful Thinking" is another hot little number showcasing the trio's penchant for funky grooves and ripping Hammond. The poignant title track, paying homage to a good friend who passed away suddenly, is bittersweet and delicate having a wonderful dream-like flow with every note taking on added depth and meaning. Thanks to albums like No Time Like Now, the trio format is alive and well. These three gentlemen can play with the best of them.